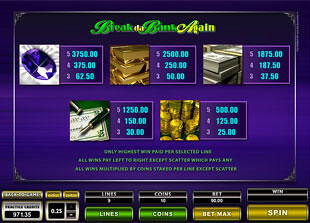 Megaspin Break Da Bank Again Slots is an amazing 5 reel 9 paylines game allowing you to play your bet four times at once. Besides that you get fantastic wild multipliers, free spins and stunning graphics. Being released in 2008 by genuine Microgaming developers, this game is a magnificent sequel of Break Da Bank and Break Da Bank Again slot machines. Dare you earn incredible sums of cash in this game! The top jackpot of 15,000 coins or $3,750 is the biggest sum you can win at once, so hurry up to strike 5 Tanzanite symbols and get the hot cash in your hands. You will also admire the Free Spins Game and crazy Multipliers, but the nicest thing about this game is that four reel blocks spin at once with only one bet. Taste the pleasant graphics of this game, and you will stay it fan for a long period of time. Add to that interesting animations or special game sounds, and you will get perfectly ready for earning serious money. All you need to make sure that our words are true is to try this fantastic slots game, so don’t miss your chance and do it right now! 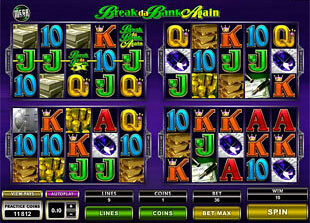 Megaspin Break Da Bank Again Slots suggests you to match up to 30 winning combinations. The featured symbols appearing on the reels are: Gold, Bank Bill, Coins, glossy Tanzanite, Dollar Pack, hard Safe and Break Da Bank Again Logo. All these special symbols can appear on the reels along with popular Ten, Jack, Queen, King and Ace. This game is balanced so well that you can stake both high and low bets – in any case you will get perfect returns. The coin size range is not that big in this slots machine, and includes $0.01, $0.02, $0.05, $0.10, $0.20, $0.25. Choose the number of lines and coins you play with, and vary your bets trying to catch a lucky strike. Also, your bet will be applied to all four reel blocks. The bets vary in this slots between $0.01 and $90. The minimal bet will fit those players, who like to play carefully and enjoy every little second of the game. The risky players will definitely admire the maximal bet of $90 allowing to get really high incomes in one spin. Anyway, you can always vary the stakes to make the game more exciting and intriguing. The highest jackpot is 15,000 coins or $3,750 for 5 Tanzanite symbols. The second jackpot is 10,000 coins or $2,500 for 5 Gold icons. The third jackpot is 7,500 coins or $1875 for 5 Dollar Packs. The wild symbol of this game is Break Da Bank Again Logo. It substitutes for any other symbol, except the scatter Safe. Every time a winning combination is matched with one wild symbol or more, the sum of your winnings goes multiplied by 5. 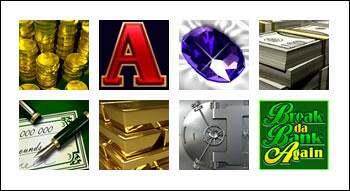 If the wild icon appears in a winning combination during the free spins, your winnings will be multiplied 25 times. The scatter icon of Megaspin Break Da Bank Again Slots is the tough Safe. It can appear anywhere on the reels, even out of paylines. 2 scatter symbols appearing during one spin will give the top reward of 180 coins, but 3, 4 or 5 scatter icons trigger the incredible Free Spins Bonus. Free Spins. 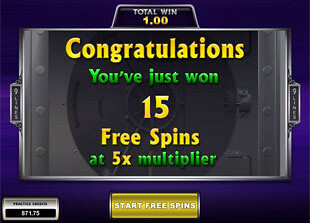 When three or more scatter icons appear on the reels simultaneously, the free spins bonus feature starts on the reels. 3, 4 and 5 Safe icons will give you 15, 20 or 25 Free Spins, respectively. Also, every Safe symbol you strike during the free spins awards you one spin more. All winnings you get during the extra spins are multiplied by 5 or by 25 if the combination contains a wild symbol. Megaspin Break Da Bank Again slot machine suggests you an incredible combination of intriguing features including free games and 4 blocks of reels span at once. Nice graphics and pleasant sounds allow you to fully merge into the atmosphere of money making, and to enjoy every moment played. We really advise you to try this great game with all its features, and the wins will surprise you a lot.